Though I particularly like John Liu, and to a lesser extent Bill deBlasio, I'm now persuaded that neither will win the nomination come September. And while I'm upset that Thompson stood up in front of God and everybody and said teachers should not get the 8% raise that virtually all city employees got in the last round of pattern bargaining, I kind of understand why he did that. After all, he'd been in virtual lockstep with UFT for some time when we saw fit to stab him in the back. I'd heard him say things that may as well have come from the mouth of Randi Weingarten. So it's understandable that the man may have been pissed off. Of course, it speaks to a lack of commitment on his part, and that's not something I particularly admire. 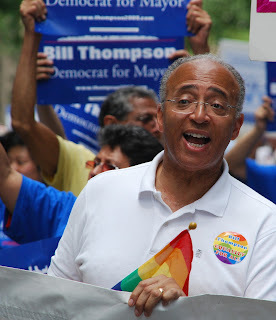 Another negative note with Bill Thompson is his close ties to Meryl Tisch, who, while not as insane as Michael Bloomberg, appears to be firmly rooted in baseless reform. Ms. Tisch is notably behind the current movement in NY that does not allow teachers to grade state papers written by their own students. The thought process behind this, as far as I can determine, is that we are all criminals who will cheat given any opportunity. However, if we discount Liu and deBlasio, Thompson becomes the only reasonable choice, and certainly the only route with which the UFT can establish itself as a force to be reckoned with. In fact, UFT phone banks can be enormously powerful, and politicians will think twice about screwing with UFT if it's perceived as a kingmaker. I've seen UFT Queens accomplish enormous tasks out of sheer determination, most notably placing Tony Avella in a seat the GOP had held for decades. If UFT gets this one right, it will be a good thing. One strong sign of how good it will be is Howard Wolfson's inane 3-page screed against Thompson in the virulently anti-teacher Daily News. Bloomberg is completely wrong calling the UFT endorsement the kiss of death, and it's time to prove that. Christine Quinn, despite her massive ego, is on a losing trajectory, and no one deserves to lose more than Ms. Quinn. Wiener is a preposterous figure propelled by name recognition for all the wrong reasons, and is our best bet to get us yet another GOP mayor in deep-blue New York City. Mr. Thompson is not the best candidate. But he is more acceptable than the other candidates, his poll numbers are likely higher than they appear, and we need to stop fooling around and win one. Bill Thompson represents our very best chance to do that. Will he fail to give us the pattern raise? If he does, he'd better think back to David Dinkins, who lost a second term when he failed to get the UFT endorsement again. If we win, a lot of politicians will be thinking that way, and the "powerful UFT" will become something more than an epithet for hateful tabloids.